Adrian Michael Smith (born December 19, 1970) is the U.S. Representative for Nebraska's 3rd congressional district, serving since 2007. He is a member of the Republican Party. He previously served in the Nebraska Legislature. Smith was born in Scottsbluff, Nebraska and at a young age his family moved to a rural neighborhood south of Gering, Nebraska. After graduating from Gering High School in 1989, Smith attended Liberty University in Lynchburg, Virginia. He transferred to the University of Nebraska-Lincoln midway through his second year of college, graduating in 1993. While a student at Nebraska, he interned in the Nebraska Governor's Office and, later, served as a legislative page in the Nebraska Unicameral. He returned home to Gering after college, and, in 1994, he began serving as a member of the Gering City Council. Smith continues to live in Gering, Nebraska. Smith has also worked in the private sector. He has been a realtor as well as a marketing specialist for the housing industry. In 1998, Smith defeated incumbent State Legislator Joyce Hillman 55%–45%. In 2002, he won re-election to a second term unopposed. Since Nebraska voters passed Initiative Measure 415 in 2001, he was term-limited. He sat on the Natural Resources and Building Maintenance committees and was the vice chairperson of the Transportation and Telecommunications committee. Smith served as Vice Chair of the Military and Veterans’ Affairs Committee and as Chairman of the Four State Legislative Conference in 2001. 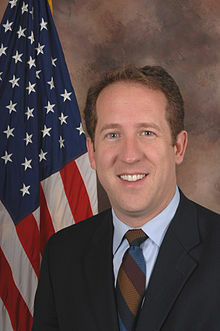 Smith ran for the open seat in the 3rd District in the 2006 House elections. Three-term incumbent Tom Osborne gave up the seat to make an unsuccessful run for governor. Smith won the Republican primary with 39% of the vote in a field of five candidates. He faced Democrat Scott Kleeb, a ranch hand and Yale graduate, in the general election. Approximately one-third of the funding of his campaign came from members of the Club for Growth, a fiscally conservative group that supports tax cuts, limited government, school choice, and advocates eliminating all agricultural subsidies and the elimination of the US Department of Agriculture. For a time, Smith was presumed to be a prohibitive favorite in this overwhelmingly Republican district. The 3rd is one of the most Republican districts in the nation; presidential and statewide candidates routinely win it with 70 percent or more of the vote. The 3rd is extremely difficult to campaign in and has few unifying influences. It covers nearly 65,000 square miles (170,000 km2), two time zones, and 68.5 of Nebraska's 93 counties (one of which, Cherry County, is larger than the entire state of Connecticut). However, Kleeb raised more money than any other Democrat had raised in the district in decades. Overall, the race was the most expensive in the district since it assumed its current configuration in 1963. In the end, Smith won by 10 percentage points, taking 55 percent of the vote to Kleeb's 45 percent. This was the closest a Democrat had come to winning the district in 16 years; in 1990, Republican Bill Barrett only defeated fellow Unicameral member Sandra Scofield by 4,400 votes. It was also only the third time a Democrat had come reasonably close to winning this district in its current configuration; besides Barrett's narrow win in 1974, Virginia Smith only won her first term by 737 votes in 1974. Besides Bush's visit two days before the election, Smith likely rode the coattails of Governor Dave Heineman, who won many of the counties in the district with 80 percent or more of the vote in his bid for a full term. Smith won the primary with 87% of the vote. He won re-election to a second term, defeating Democrat Jay Stoddard 77%–23%. Smith won the primary with 88% of the vote. He won re-election to a third term, defeating Democrat Rebekah Davis 70%–18%. He won the Republican primary with 82% of the vote. He won re-election to a fourth term, defeating Democrat Mark Sullivan 74%–26%. ^ "Biographical Directory of United States Congress". SMITH, Adrian. Retrieved August 1, 2007. ^ "Our Campaigns - NE Legislature 48 Race - Nov 03, 1998". Retrieved June 9, 2016. ^ "Our Campaigns - NE Legislature 48 Race - Nov 05, 2002". Retrieved June 9, 2016. ^ "National Conference of State Legislatures". Term Limits in Nebraska: A Timeline. Archived from the original on November 29, 2005. Retrieved March 20, 2006. ^ "Nebraska Unicameral Legislature". Sen. Adrian M. Smith. Archived from the original on February 19, 2006. Retrieved March 15, 2006. ^ O'Hanlon, Kevin (October 16, 2006). "Moul gives Fortenberry run in fundraising". Lincoln Journal Star. Retrieved November 2, 2006. ^ Walton, Don (October 27, 2006). "GOP eye on 3rd District House race". Lincoln Journal Star. Retrieved November 10, 2006. ^ Levinson, Nathan (November 3, 2006). "Neb. Roundup: Bush Visit Points to GOP Vulnerability". New York Times. Retrieved November 10, 2006. ^ Thompson, Jake; Robynn Tysver (November 5, 2006). "Bush rallies GOP faithful in Grand Island". Omaha World-Herald. Archived from the original on April 22, 2005. Retrieved November 10, 2006. ^ Hendee, David; Paul Hammel (November 9, 2006). "Another Smith going to Washington". Omaha World-Herald. Archived from the original on April 22, 2005. Retrieved November 10, 2006. ^ "Our Campaigns - NE District 3 - R Primary Race - May 13, 2008". Retrieved June 9, 2016. ^ "Our Campaigns - NE District 03- R Primary Race - May 11, 2010". Retrieved June 9, 2016. ^ "Our Campaigns - NE - District 03 Race - Nov 02, 2010". Retrieved June 9, 2016. ^ "Our Campaigns - NE District 3 - R Primary Race - May 15, 2012". Retrieved June 9, 2016. ^ "Our Campaigns - NE - District 03 Race - Nov 06, 2012". Retrieved June 9, 2016. This page was last edited on 17 April 2019, at 07:46 (UTC).